Enter your email address below to receive "How To Answer A Jesus Critic. 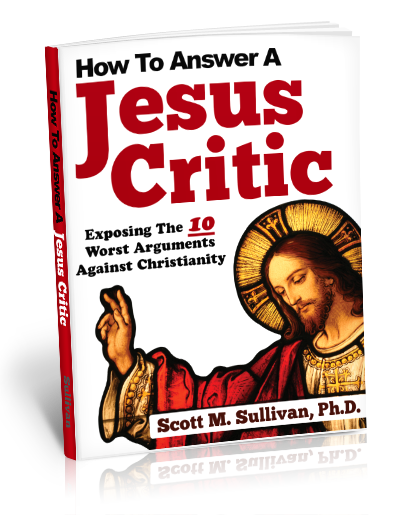 How To Answer A Jesus Critic: Exposing the 10 Worst Arguments Against Christianity by Scott M. Sullivan, Ph.D.
“Christians are a bunch of hypocrites." Dr. Scott M. Sullivan, founder of Classical Theist Productions. (Curriculum Vitae 2003; M.A., Philosophy, Holy Apostles College, Ph.D., Philosophy, University of St. Thomas, Adjunct Professor of Philosophy at the University of Houston, San Jacinto College, and University of St. Thomas (Houston) 2004-2008). Enter your email address above to get instant access to this course.